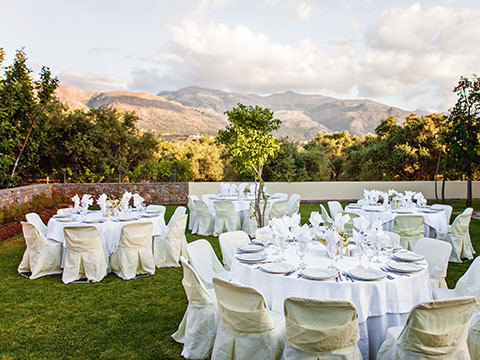 The island of Crete is a simply stunning location for your destination wedding; with dramatic sunsets, mountain vistas, endless turquoise waters and ancient architecture. Our professional team here at Luxury Villas on Crete work diligently on making wedding dreams become a reality. With a detail-orientated and proactive approach, we listen careful to your plans and concepts for the Big Day, then prepare everything for you. 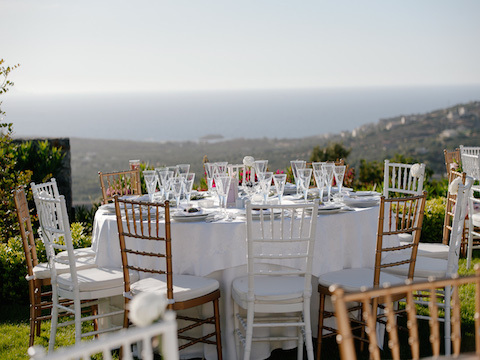 So if you have imagined an idyllic wedding by the Mediterranean sea, then contact us to discuss your ideas - we can make your Mamma-Mia-esque dream materialise in front of your eyes. With so many resources at our fingertips, we can become your Cretan fairy godmother, taking care of everything and making a tailor-made, truly magical luxury wedding. We stayed as a family of 12 adults and an infant at this fabulous villa in June 2016. The villa is superb and easily accommodated all the guests in comfort. The pools and the grounds are well maintained and the villa offers panoramic views along the north Crete coastline. There are several resorts within easy reach including Sisi, Malitos, Malia and Stalis. The highlight of the holiday was our daughter's wedding with the reception for 47 guests held in the vast grounds of the villa. The backdrop to the reception was a glorious sunset which took place while the food was being served. After the Greek musicians had finished, we then held a disco on the patio and the bar was also set up nearby. Everyone had a great evening, a real wedding to remember for the rest of our lives. Again, the villa coped easily with all the guests and made the occasion very special. Audrey, the villa manager and her assistant, Eva were so helpful throughout our holiday and are so reliable, friendly and efficient. Audrey assisted with locating a stunning little church at which to hold the wedding and recommended a local wedding planner. She made the holiday and the wedding run very smoothly. I would strongly recommend this villa to anyone looking for a very special location to holiday or host a wedding or both !! I just want to say a massive thank you to Audrey, Eva and Christos for making my special day truly perfect Audrey and Eva are very professional but friendly at the same time , they totally took the pressure of me so my wedding day was amazing. The villa Athena was the perfect venue for the wedding with all ammentities near by. The villa is immaculate, very modern , clean and comfortable for all my family who stayed with us for a few days. The service also carried out ie cleaners , pool man etc where very pleasant and thorough at there job. Christos who works in conjunction with Audrey is a lovely man who made sure everything was correct and finalised for our wedding, all my guests said this was by far the best wedding they had attended and i cannot thank the team enough for achieving my dream wedding. So i strongly recommend you use Luxury Villas on Crete , as i will definitely be returning next year for my anniversary. As soon as we met Audrey and the team we knew we were in good hands. Not only did they take care of the paperwork and legal side of wedding planning, they were able to recommend excellent photographers, caterers and florists. Every aspect was taken care of and they really took the stress out of planning a wedding abroad. The villas are incredible and were perfect for a group holiday. They are in a stunning location for a picturesque wedding. Our day was magical and anyone getting married in Crete will have a wedding to remember. Thank you for making it the happiest day of our lives. This was just perfect for our daughter's wedding. The staff couldn't have been better and really took a personal interest in our daughter and son-in-law's wedding reception. We received so many compliments that evening and later through emails and texts about how much our friends enjoyed the food, beverages, and the venue overall. Thank you so much for making this a perfect ending to a perfect day!! !